If you read our previous post, you have already learned half of the arsenal of tools available in Adobe Photoshop. While the program is complex and, therefore, contains a few more tools to master, we will cover them here, turning you into a Photoshop pro! If you are new to photo editing, Adobe Photoshop is a graphics software program for photographers, designers and digital artists. It is quite helpful in fixing all sorts of photo issues, from redeye to blurriness. The following tools, along with those covered in our previous post, will allow you to fix just about any problem you may find in your digital photos. Hold down the alt key over the image — the cursor will change to a target. Click the point you want to use as a sampling point; this will be recreated in the cloned area. Left-click and drag the cursor where you want the cloned image to appear. As you move your mouse, a cross will appear on the original image while a matching circle appears where you are drawing. Eraser- Select the tool, left-click and hold down on the area you would like to erase. Background Eraser Tool- By using this tool, you can remove the image’s background color. The eraser samples the color you originally click on and removes this color as you move the cursor across the image. Magic Eraser Tool- Erases all colors within a pre-set scale. In essence, this tool acts the same as using the magic wand and hitting Delete. Unlike most Photoshop tools, you don't need to drag your cursor while using this — just click once. This lets you move a selection or entire layer by dragging it with your mouse; you can also use your keyboard’s arrow keys. When the move tool is selected, click and drag anywhere in the image. If an area is selected, it will be moved. If not, the whole layer will be moved. Another option is to use your arrow keys to move the selection or layer in small increments. You can also hold down the shift key to move in larger increments. In the options bar, select a Tolerance value (0 to 255). This determines how closely to match colors— higher tolerance means a larger selection. Check Contiguous to select only areas that are joined together. Click the image in an area that you want to select. 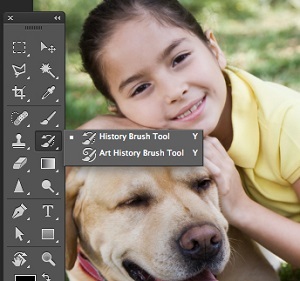 The history brush uses a previous state of an image to create a copy of the image as it was before edits. It then uses this copy to paint with. This may seem overwhelming at first, and it may take some trial and error. But by experimenting with photos, you can learn how to edit them like a pro!